You'll be £4.99 closer to your next £10.00 credit when you purchase Hitler's Tank Killer. What's this? Sturmgeschütz III was originally designed as an assault weapon, but as war progressed it was increasingly used in a defensive role and evolved into an assault gun and tank destroyer. By 1943 its main role was providing anti-tank support to the units in its area of operation. This consequently led to many StuGs being destroyed in battle. Nonetheless they were very successful as tank killers and destroyed, among others, many bunkers, pillboxes and other defences. The StuG was not considered to be a true tank because it lacked a turret. The gun was mounded directly in the hull, in a casemate-style fashion, with a low profile to reduce vehicle heights, and had a limited lateral traverse of a few degrees in either direction. Thus, the entire vehicle had to be turned in order to acquire targets. Omitting the turret made production much simpler and less costly, enabling greater numbers to be built. Its significantly shorter vertical profile as compared to contemporary tanks made the StuG more difficult to hit. Most assault guns were mounted on the chassis of a Panzer III or Panzer IV, with the resultant model being called either a StuG III or StuG IV respectively. The StuG was one of the most effective tracked vehicles of World War II, and over 10,000 of them were eventually produced. During the course of the war StuG III assault guns were issued to Sturmartillerie Batteries, Sturmgeschütz Abteilungen, Sturmgeschütz Brigades, Sturmartillerie Batteries, Ersatz (Reserve), Abteilungen and Funklenk (Remote Control) Companies. StuG III assault guns served on all fronts of WWII until the end of the war. This entry in Pen & Sword's Images of War series focuses on the Sturmgeschutz, or StuG, the German motorized armoured assault gun that evolved into a potent anti-tank weapon. The pictures cover the entire wartime career of the StuG, from its early appearances in France in 1940 to the final desperate defensive battles of 1945. The evolution of the StuG from the original short-barrelled assault gun to the long-gunned tank killer is also charted, as is the appearance of the StuG IV. There are also some good pictures of the StuG's half-track support vehicles, and of the crews of the assault guns, showing their distinctive uniforms (similar to the black Panzer uniform but grey-green to make it less conspicuous). 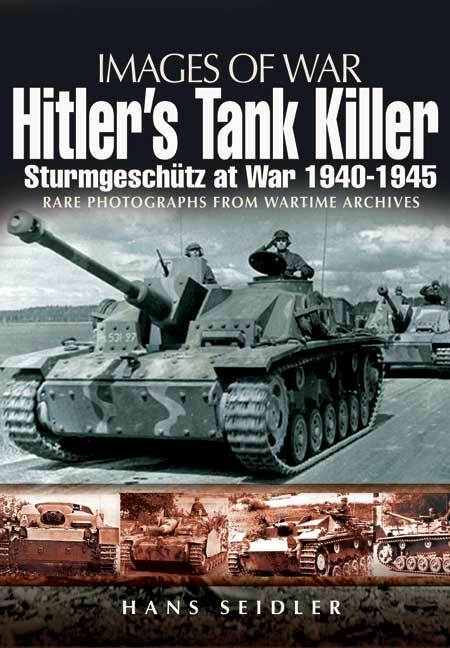 Most of the captions are very informative, picking out key facts from the pictures, including sub-types of StuG and units. The pictures are of a generally high standard, with a good level of detail and would be of use to the modeller. A good range of angles are shown for most models of StuG, and there is a section discussing the camoflage used on the StuG and how it changed during the war. Hans Seidler is an avid collector of rare wartime images. He is the author of Hitler’s Tank Killers and cooperated with Ian Baxter on Barbarossa (both published by Pen and Sword in the Images of War Series). He can be contacted through Ian Baxter who lives near Chelmsford.